Whether you work from home because you telecommute, run your own business, or simply want a space that makes tackling boring tasks like paying bills feel less like a drag, creating a dedicated and functional work space can help boost productivity and motivate you to get some work done. 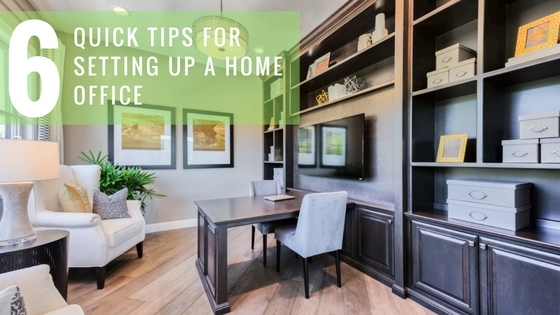 When planning your new home office, there are a few things you should absolutely consider to make sure your home office works best for your workflow. But before you start searching Pinterest for design inspiration, consider these 6 things so you’re able to set up a home office you really want to work in. Determine your purpose. One of the first things you should consider is how will the space will be used and by whom. Will it be a dedicated working office for a single person or will it serve as a shared office space with other family members? If you’ll be sharing the office, be sure to discuss what each person will need in terms of workspace and storage needs. Select the location of your office. Consider your home and where you can place your office. Whether your converting a spare room or have a dedicated office area, make sure the room you select works with what you need to be productive. Is it tucked away in a quiet area of the house with little distraction or does it have a door that will allow you to close it whenever you need to focus? Let the light in. If you’re able to choose a room that has a lot of natural light, consider placing your desk where you can stare out of the window (or door) when you give your eyes a break from the computer screen. Even if your office space has glorious amounts of natural light, supplement the light with more direct lighting, including task or desk lamps and floor lamps. This will allow you to work well even on cloudy or overcast days and into the evening. Invest in a quality chair. While you can use creative shortcuts to furnish your home office without going into debt, one thing you should splurge on is your desk chair. While Pinterest may be filled with pretty pictures of upholstered dining room chairs and acrylic ‘ghost’ chairs, they may not provide the left of back support and comfort you’ll need to make it through a full work day. Get creative with storage. One possible drawback of a home office is the limited storage options, especially if your chosen room is a little on the smaller size. Regardless of size, you want to make sure you have enough room to work. If space is an issue, consider double-duty office furniture: build a desk that uses file cabinets as legs Also consider keep the essentials nearby and any files or supplies you don’t need very often can be stored in another room. Personalize responsibly. A big perk of creating a home office is the ability to personalize your workspace in ways that’s not possible in a cubicle. Add a few office plants, choose a few select décor items like family photos, art prints, inspiration quotes and, if space allows, create some comfy space with a comfortable armchair or sofa where you can move from your desk to do some thinking or reading or even host clients.